As I’ve noted here several times, one of the common stumbling blocks people face is what to publish. I’ve stressed my belief that regular, fresh content is an important aspect of overall website health and “find-ability”, but that does mean coming up with something every so often. It’s a valid concern, because it’s not always easy. For example, it’s been a couple of months since I updated this site. In our effort to add value, it’s easy to fall into the trap of thinking that we need to do everything ourselves. Couple that with the oft-heard “Someone’s already written about everything I can think of”, and you have a perfect answer to the very problem you think you have: share what others are saying. I’m not (not, not, NOT) suggesting you copy their work, or copy/paste what they’ve written. Even with attribution, unless you have their explicit permission, that’s still violating copyright at best, and plagiarism at worst. What I’m suggesting instead is you reference their work. Link to it. Perhaps provide an image or a quote from it (under “fair use” rules of copyright law), and link to it. We’re all flooded with information, and that’s just as true for your audience as it is for you. The difference is they don’t have your expertise to separate the wheat from the chaff – to notice the gold nugget in the pan of sand – to recognize the noteworthy and set aside the inconsequential. As a result, they miss much of what is important and waste time with what is not. By using your expertise and wading through some of that noise, and sharing what you consider to be of value to your audience, you’re making their lives easier. You’re providing a source of qualified information they would either not have access to, not have the time or resources to cultivate themselves, or simply not recognize amongst all the noise they’re faced with every day. You’re adding value, even if it’s not you doing the writing. I came to this topic for Ask Leo! on Business in a somewhat backwards way. I created a project and then realized the broader implications of the technique I’d adopted. In a world where there is so much divisiveness, anger, and just generally bad news filling our news feeds, social media streams, inboxes and more, I wanted to find more of the opposite – the good news I know is out there, buried beneath the screaming headlines. So once a day I’d look for a current news story of a more positive nature. Initially, I did this just for myself. Then I started sharing what I found each day on Facebook. That was positively received, and I started using the hashtag #notallnewsisbad. That’s been running for a couple of weeks now, and each day I browse through the day’s news looking for a current story of a positive nature. When I find one I like, I add a comment of my own and post it. All the technology kicks in, and the next morning, over 800 people get it by email. Feedback was immediate and positive. People appreciate what I’m doing. You know … adding value to the world, in my own little way. Consider your topic and area of expertise. You probably have resources you already use, and know of others that are appropriate for your audience. Pick and choose the items you think are relevant and offer value to your audience – that’s curation – and share what you select. Perhaps add some commentary as to why you think something is interesting, and point to it. It could be someone’s blog post, a reference article, a news item, a YouTube video … it doesn’t matter what it is, as long as it adds value to your audience. One hundred percent of the content I share on Not All News Is Bad is curated in this way. It definitely adds value to those who are interested in the topic. 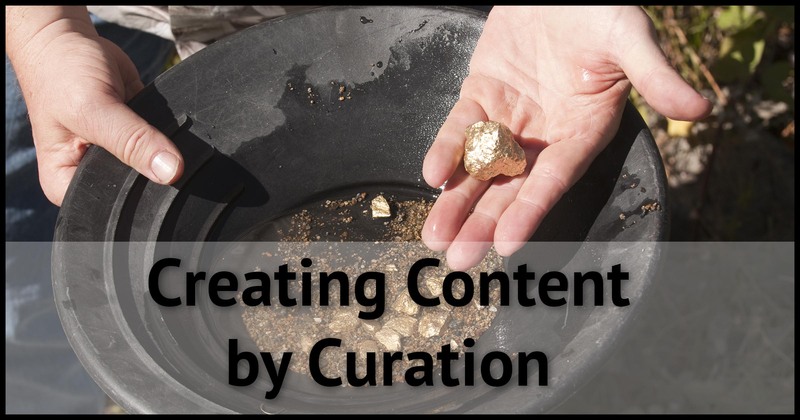 You don’t have to post exclusively curated content at all; you can intermix your original content as you see fit. Just remember you don’t have to do it all yourself. The only real job you have is adding value. Like the site. Excellent change of pace. I had a perfect example within the last month. I mentioned a podcast I like , and one of my readers expressed his delight to me and the folks who produce the podcast. Then they expressed their delight! What you are describing sounds a lot like academic articles. For example, I just had an article accepted for publication that had over 100 citations. It was on a topic I did not know much about when I started, but I know how to research and learn and I turned that research into a publication. Now, I will be the first to admit that it is hard and time consuming. I spent 100’s of hours on that one article. I know that is not what you are suggesting here, but it does point to the fact that there is a strong history of producing content this way.